If we were ranking sodas by their own merit, and not against other root beers, Dang Butterscotch Root Beer would rank well. Handy Father, however, only does root beer reviews. Dang! doesn’t compare to other root beers. The smell is a sweet one, with a distinct creamy scent. When poured into a properly frosted mug, Dang! Butterscotch Root Beer has a large, foamy head. Interestingly, the butterscotch flavor and the root beer flavors hit the palate at different times. Obviously, the dominant flavor is that of butterscotch… the hard-candy in cellophane type of butterscotch. It isn’t bad, but it is hardly root beer. We generously gave the Dang Butterscotch Root Beer review a score of 3.0 out of 5 stars. Butterscotch lovers will enjoy this soda, but root beer aficionados will cringe at the idea as well as the defiled flavor that is Dang! Butterscotch Root Beer. 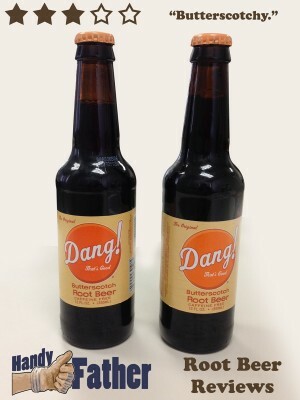 Dang Butterscotch Root Beer ingredients: carbonated water, high fructose corn sweetener, caramel color, citric acid, sugar, citric acid, natural and artificial flavor, and sodium benzoate to preserve freshness. Butterscotch lovers can get this brew here, Dang! Butterscotch Root Beer , and I recommend others give it a try once as well. What is your opinion of Dang Butterscotch Root Beer? Most people seem to enjoy it, and that’s the beauty of flavor! It is different for everyone. Comment below or give @Handyfather a tweet with your impressions.